Baga Beach: Undisputedly the most popular beach of Goa is the Baga Beach which is thronged by a large number of tourists day in and day out. 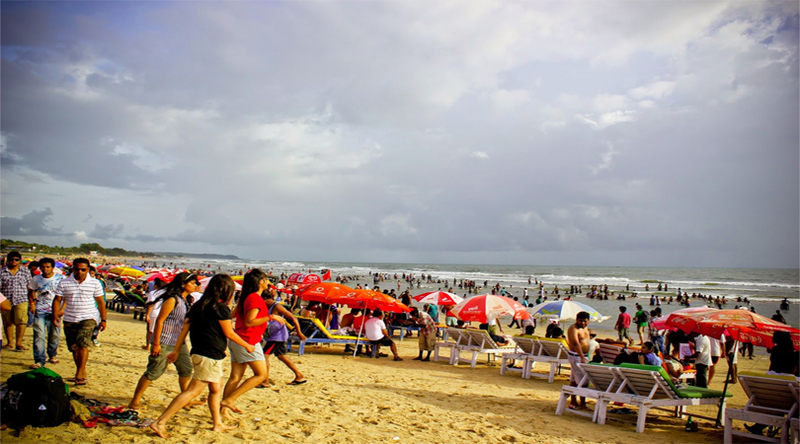 Blame it on the scenic surroundings and a multitude of fun activities that the Baga beach offers, it is sure to be placed in every Goa tour itinerary. One can just unwind having a sunbath or can engage in dolphin spotting, water sports to add a dash of adventure to his/ her trip! Basilica of Bom Jesus: A UNESCO World Heritage site, Basilica of Bom Jesus is one of the most important tourist destinations of Goa. It is deeply revered by Christians all over the world for it enshrines the mortal remains of St. Francis Xavier (one of the most celebrated Christian missionaries). It also has the distinction of being one of the oldest churches in India. The Cathedral: Being milky white in color, this stands as an eye pleasing and peaceful tourist destination of Goa. It is interesting to note that Se Cathedral is the largest church in India. Built lavishly by the Portuguese to immortalize their victory over Muslims, it is sure to leave every onlooker spell bound with its grandeur. Fort Aguada and Aguada beach: Goa has several imprints of Portuguese architecture and Fort Aguada is one excellent example of their architectural finesse. This fort was built by them to serve as a landmark for their territory and being prone to invasion, the location was also chosen strategically as a good political move. With the history, exploration, one can also enjoy the tranquil atmosphere at the Aguada beach. Anjuna Flea Market: Started as a small time market by the hippies, Anjuna Flea Market has evolved over the years to become a hit among the Shopaholics. A fulfilling shopping trip is promised in this market as one can find clothes, jewelry, souvenir articles, etc. and we can bet that one is sure to succumb to his /her shopping temptations here. Panjim City: A beautiful color riot awaits you as you pay a visit to Panjim city- the capital city of Goa. The Portuguese style houses, bakeries and everything around is done in tasteful bright colors. One can just walk around to freshen up himself / herself as this city perfectly serves the purpose.